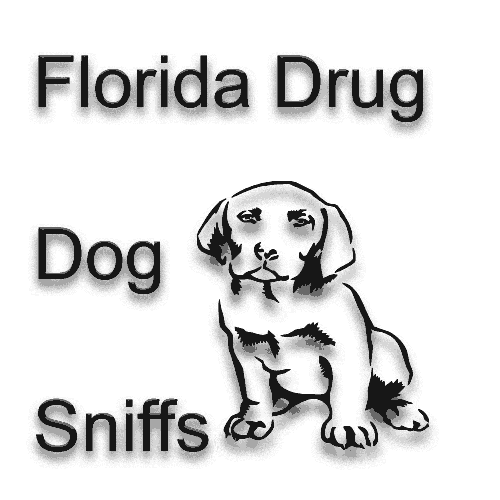 Here are the facts of the most recent dog sniff case we have seen in Florida. Officer patrolling with his drug detection dog when driver spotted in a truck with no seatbelt. Driver stopped for seatbelt violation. Cop asked driver to step out of the vehicle. Cops asked for consent to search the truck - denied. The officers then decided to conduct a “free sniff” with the dog. By that time, the information had come back from dispatch on the license and registration. Rather than write the ticket for the seatbelt offense, the officer went back to his car, retrieved the dog and commenced the sniff on the outside of the vehicle. Not surprisingly, dog alerts and meth found. 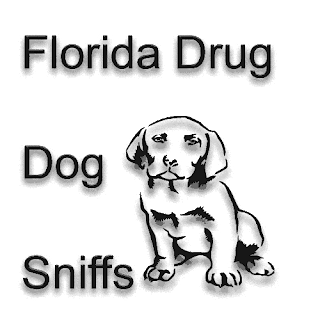 Why did a Florida Drug Crime Court find a Drug Dog Sniff was Unreasonable? "the officer had obtained all the necessary information from dispatch and could have started to write the ticket immediately. Instead, he decided to interrupt the traffic stop for the dog sniff." Appellant Lee Underhill appeals his convictions for possession of methamphetamine and use or possession of drug paraphernalia. He contends that the trial court erred in denying his motion to suppress evidence recovered during a traffic stop, because the officer unconstitutionally prolonged the stop by interrupting it to use a drug sniffing dog. Based upon Rodriguez v. United States, 135 S. Ct. 1609 (2015), and Jones v. State, 187 So. 3d 346 (Fla. 4th DCA 2016), we agree that the traffic stop was prolonged and the evidence discovered during the prolonged stop must be suppressed. We reverse the conviction and sentence. violation. Appellant seemed nervous and the officer asked appellant to step out of the vehicle. At the same time and while standing beside the truck, the officer called in the license and registration information to dispatch. While waiting for the information to come back on the license and registration, the officers questioned appellant. They asked for consent to search the truck, which appellant refused. The officers then decided to conduct a “free sniff” with the dog. By that time, the information had come back from dispatch on the license and registration. Rather than write the ticket for the seatbelt offense, the officer went back to his car, retrieved the dog and commenced the sniff on the outside of the vehicle. Within a couple of minutes, the dog alerted on the vehicle. The deputy advised the driver that the dog had alerted, and they were going to search the vehicle. Inside, the dog alerted to a black bag located on the driver’s side floorboard near the transmission hump. The bag contained drug paraphernalia, and appellant was arrested. Later that day, the officers also wrote a traffic citation to appellant for the failure to wear a seatbelt. The State charged appellant with possession of methamphetamine, and use of, or possession with intent to use, drug paraphernalia. Appellant moved to suppress the evidence, contending that the search of his vehicle was unconstitutional under Rodriguez, 135 S. Ct. at 1612, which was published just prior to the trial of the action. After hearing the testimony of the detectives, the trial court denied the motion, concluding that the use of the dog did not prolong the traffic stop more than the reasonable time it would otherwise take to complete the stop and write the traffic citation. The jury convicted appellant of both charges. The court sentenced appellant, and this appeal follows. Appellate courts review de novo suppression issues that turn on an issue of law and defer to the trial court on findings of fact which are supported by competent substantial evidence. Connor v. State, 803 So. 2d 598, 605 (Fla. 2001). In this case, the trial court’s analysis was based upon a mistake of law. the officer discovered oxycodone pills. Id. Only about three minutes passed from the beginning of the traffic stop until the dog alerted. Id. Prior Supreme Court cases have held that a traffic stop “can become unlawful if it is prolonged beyond the time reasonably required to complete th[e] mission” of issuing a ticket, Caballes, 543 U.S. at 407, 125 S.Ct. 834, and that a seizure is lawful only “so long as [unrelated] inquiries do not measurably extend the duration of the stop.” Arizona v. Johnson, 555 U.S. 323, 333, 129 S.Ct. 781, 172 L.Ed.2d 694 (2009). Rodriguez, however, eliminates any ambiguity about the reasonableness of the time required for the officer to complete a traffic stop. As the Court made clear, “[i]f an officer can complete traffic-based inquiries expeditiously, then that is the amount of ‘time reasonably required to complete [the stop’s] mission.’” Rodriguez, 135 S.Ct. at 1616 (second alteration in original) (quoting Caballes, 543 U.S. at 407, 125 S.Ct. 834). “The critical question, then, is not whether the dog sniff occurs before or after the officer issues a ticket . . . but whether conducting the sniff ‘prolongs’—i.e., adds time to—‘the stop.’ ” Id. Jones, 187 So. 3d at 347-48. In other words, the issue is not, as the trial court thought, what is an objectively reasonable time in which to complete the traffic stop, but whether the dog sniff in this particular stop “adds time to” the stop. Rodriguez, 135 S.Ct. at 1616. In Jones, our Court concluded that the officer had abandoned the purpose of the stop by deciding not to write a ticket but to start the dog sniff. Jones, 187 So. 3d at 348. Therefore, the stop was prolonged beyond what was necessary to accomplish the mission. Id. Likewise, in this case, the officer had obtained all the necessary information from dispatch and could have started to write the ticket immediately. Instead, he decided to interrupt the traffic stop for the dog sniff. Although it was only a short period of time until the dog alerted, under Rodriguez, the sniff unconstitutionally prolonged the completion of the mission of the traffic stop. to complete traffic “mission” but remanding for determination of whether independent reasonable suspicion of criminal activity existed); U.S. v. Williams-Davis, No. 2:14-cr-04072-SRB-1, 2015 WL 6942499 (W.D. Mo. Nov. 10, 2015) (denying motion to suppress where officer had not completed checking identification information at the time the dog alerted to drugs); U.S. v. Kendrick, No. 10–CR–6096–FPG, 2015 WL 2356890 (W.D.N.Y. May 15, 2015) (denying a motion to suppress citing Rodriguez and determining in a minute-to-minute analysis that the stop had not been improperly extended); State v. Warren, 775 S.E. 2d 362 (N.C. Ct. App. 2015) (affirming denial of motion to suppress where dog sniff was performed while a backup officer completed writing out traffic citation). Our conclusion in this case and in Jones is in accord with these cases. For the foregoing reasons, we reverse the conviction and sentence and remand for further proceedings. CIKLIN, C.J., and GERBER, J., concur.